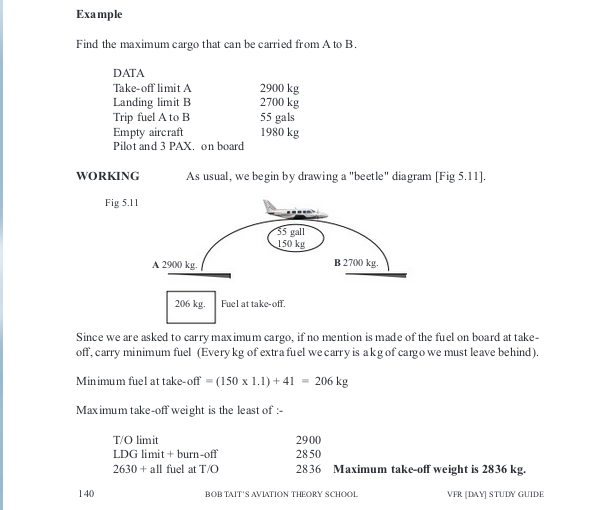 On page 141, the example continues to determine the maximum cargo possible. So here, the MTOW has changed to 2843kg (it should be 2836) and the all fuel at T/O is shown as 213 (it should be 206) As a result the maximum cargo is 'wrong' due to the incorrect values. The reason is probably because the older 15% variable fuel is used rather than the new 10%. Thanks again I really do appreciate your feedback, and yes it looks like the 15% has reared it's head again, but it does not change the answer as your ZFW limited. Last Edit: 2 months 2 weeks ago by Stuart Tait. Stuart Tait wrote: ...but it does not change the answer as your ZFW limited.